In this article, I am going to discuss the first stages of the trip planning, which primarily centers around planning what we want to see, when we want to go, and how long we will need to be there. In order to answer these questions, I will share a number of different methods and resources I used to research what to see in Australia and New Zealand. I will also share with you how I typically decide when the best time to visit a location is. This is important because when you take a trip can often be a key factor in how successful that trip is. Finally, I will show you how I determine how long I will need to spend at each location when planning the duration of my trips. All of these decisions are critically important to your trip and can have a big impact on how your trip goes. If you don’t research a location well enough, you might miss out on some really amazing things you could have seen. Likewise, if you don’t plan enough time on your trip, you might be forced to skip out on some of those really cool things you researched. On the other hand, if you plan too much time on your trip, you might end up spending a lot more money on your trip than you really needed to. It’s all a balance and I am going to show you how I manage these decisions when I am planning trips. One of the first things you need to do when planning any trip is to decide what you want to see when you get there. This requires doing a lot of research on the locations you will be visiting to see what other people suggest and what looks appealing to you. Once you have this list, you can start narrowing down the things you want to see and do on your trip, which will give you a better idea of when you will want to go and how long you will need to stay. To give you an idea of how I typically do research for a trip, I have included some of the resources I have used to do research for our upcoming Australia and New Zealand trip below. Using the resources above, and talking to other travelers who have visited or lived in Australia, we started to narrow down the cities in Australia that we want to visit. We will more-than-likely be flying into Sydney, and there is a lot to see and do in that city, so it definitely makes our list. We also want to see the Great Barrier Reef, and my research suggests that Cairns is the best city to visit in Australia to do that, so it makes our list as well. Finally, we got a lot of feedback from people that the city of Melbourne is the cultural capital of Australia and is a must visit, so we have rounded out our general plans by including a stop in Melbourne as well. Below is a compiled list of all of the things that we are interested in possibly seeing when we visit Australia. This list will be used to determine how much time we will spend in Australia and help us fill out our itinerary. When we started going thru all of the visitor guides for New Zealand and started talking to people who have visited New Zealand, it became abundantly clear that New Zealand’s South Island is an absolute must visit if you are going to New Zealand. Since we are going to be limited in the amount of time we will be spending in New Zealand, we have tentatively decided to focus on just the South Island. Below is a list of things we would like to see and do on the South Island, which will help us decide how much time we should spend there and help us fill out our itinerary. Once we had a pretty good understanding of what we would like to see and do in Australia and New Zealand, the next step was to determine when we would be making the trip. One thing we knew for certain is that we did not want to be traveling over the holidays. This means that we would be looking to travel sometime before the middle of November. Because this trip will likely be a lengthier trip, anytime after mid-November will almost certainly interfere with holiday plans and preparations. When deciding the best time to make a trip, I will typically chart out the key factors for all of the locations I will be visiting and then look for a time when conditions are favorable for all of the locations. For instance, if I am concerned about the weather on my trip, then I will want to chart out the average temperatures for the parts of Australia and New Zealand I will be visiting and then determine which months have the ideal weather at both locations at the same time. As you can see from the chart below, temperatures in Australia and New Zealand are the most ideal between November and March, which is late Spring thru early Autumn in the southern hemisphere. While April and May or September and October aren’t ideal, the temperatures during early Spring and late Autumn aren’t too bad either. It is the winter months of June thru August that I would prefer to avoid as temperatures can be much colder, especially in New Zealand. The other factor that we have to consider is the cost of travel. This is an important factor because we are likely looking at a lengthy trip, which means that costs will add up because of the number of days on the road. In order to put the cost in perspective, I first turned to the Hopper App to look at the trends for airfare costs between Milwaukee and Sydney Australia. I have included a chart of my findings below for you to review. As you can see in the chart above, airfare prices start to rise beginning in the middle of September. That covers the airfare aspect of my research, but I also need to take into account hotel prices. In order to determine how hotel prices vary in the locations we will be visiting in Australia and New Zealand, I picked a handful of hotels in each location and then compared the average hotel charge for the group of hotels over the time period of August thru mid-November. I have included a chart with my findings below for you to review. As you can see in the chart above, the cheapest period of time for hotel rates this Spring in Australia and New Zealand will be in September. This also coincides with some great airfare deals in mid-September, which means that the month of September looks to be the best month for us to travel from a cost stand-point. The temperatures in Australia in September are fine, but September isn’t the ideal time to be visiting New Zealand. However, if we put our stop in New Zealand on the back-end of our trip, everything should fit perfectly from both a temperature and cost stand-point. Once I determined when it would be best to take our trip to Australia and New Zealand, the next step was determining how long we would spend there. We have roughly three weeks to spend on this trip, so I needed to determine how to split up that time between Sydney, Cairns, and Melbourne in Australia and New Zealand’s South Island. Our visit to New Zealand is going to involve a lot of driving because public transportation is much more limited and we will be touring a much larger area that we will be in the cities in Australia. For that reason, I knew I would need to schedule more time in New Zealand. In the end, I consulted the resources I listed above, and talked to several people who have visited Australia and New Zealand, and came up with the following breakdown of our trip time. We will be spending three days each in Cairns and Melbourne, four days in Sydney, and ten days on New Zealand’s South Island. We will reserve two days to get there (because of the day lost with the time change) and one day to get home (where we will benefit from the time change). This gives us a total trip time of twenty-three days. As soon as we established how long we would be traveling for, the next step was to start putting together a rough itinerary for our trip. We already had a good idea that we would be flying in and out of Sydney, Australia because we knew we would be using Delta Airline miles for this trip and we have a lot more flight options in-and-out of Sydney with Delta. We also knew that we would want to visit New Zealand’s South Island on the back-end of our trip because of the weather, so those two pieces of the logistics were pretty easy to figure out. 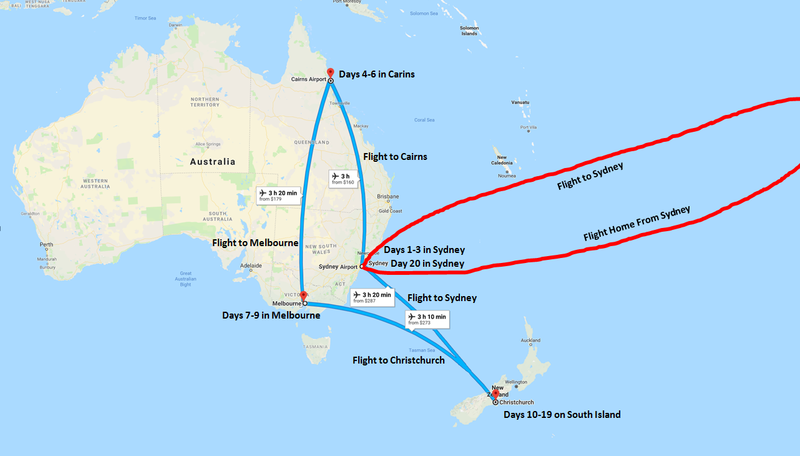 From there, we needed to figure out whether we would be visiting Cairns or Melbourne first after visiting Sydney and before visiting New Zealand. In the end, we did a quick airfare comparison for flights from Cairns to Christchurch and from Melbourne to Christchurch and determined that it would be cheaper for us to fly from Melbourne to Christchurch. This means that we will be visiting Sydney first, followed by Cairns and then Melbourne. Finally, we will visit New Zealand’s South Island and then fly back to Sydney to return home. For a visual representation of what our trip will look like, please refer to the map below. So now that we have a rough framework of what our trip will look like established, in my next travel planning post I will start to fill in the details. Specifically, we will look at how we saved a bunch of money booking out flights, how we strategically booked our accommodations to save money, and what our transportation logistics will look like. I will also start to fill in our itinerary with details and talk about some of the cool tours and activities we are thinking about booking. Oops! I think I posted my comment in the wrong place, from Facebook. Here it is linked to my blog. I’m very impressed by your extensive planning. People always tell me my planning is quite extensive, but yours takes top honors! I do a couple of series on my blog titled “Call to Place” (about how you are called to a place), and “Anticipation and Preparation” (about how you go about planning and preparing) and I invite others to link with their plans. If you’d like, I can link this post to my post on anticipation that will post early Friday morning (2:00 a.m, Eastern Time). I’d love to link it; just let me know if you’d like me to. Good luck on your trip to Australia and New Zealand. Sounds like a fantastic trip. By the way, I love how you included charts too. I’d have no idea how to do that. Have you ever used the app Polar Steps? It is really cool because you can update it as you travel and then it shows all your movement on a map. So thorough. I love it! I would be curious to know how many flights it will take you to get there, where those layovers are, overall travel time getting from Milwaukee to Sydney, etc., if you’re willing to share. Thanks! And absolutely, happy to share. It will take roughly 28 hours for us to get from Milwaukee to Sydney. We will go from Milwaukee to Minneapolis to Los Angeles to Sydney. We intentionally booked 2-4 hour layovers in Minneapolis and LA do that we have some cushion for delays. Been burned by short layovers too often in the past. Longest flight is from LA to Sydney, which is roughly 15 hours. Ugh. Sounds dreadful, and it’s just as I had feared. The longest flight I’ve been on was Prague to Atlanta. I think it was 10.5 hours. I barely survived. Next Christmas we have our first trip to Asia and I’m sure that series of flights will test me. It’s the price we have to pay for great travel experiences, though. Thanks for the details. No problem! I agree, those long flights really test your patience. We decided to pay a bit extra and book Delta’s premium select class. Helps that we had enough points for a free ticket at that fare. My longest so far was to Tanzania, which was 8 hours to Amsterdam and then 9 hours from there to Arusha. At least we had a break in between then. This is 15 hours straight, which will be a test for me. Just a bit of advice, Josh. The Great Ocean Road and the Twelve Apostles are hours away from Melbourne. Have a great trip. I’ve only ever driven down there, Josh, so I don’t know about tours. It’s a gorgeous drive and in a rental car you could stop whenever you felt like it. I have family at Aireys Inlet, the other side of Anglesea. I recommend stopping at the lighthouse there.